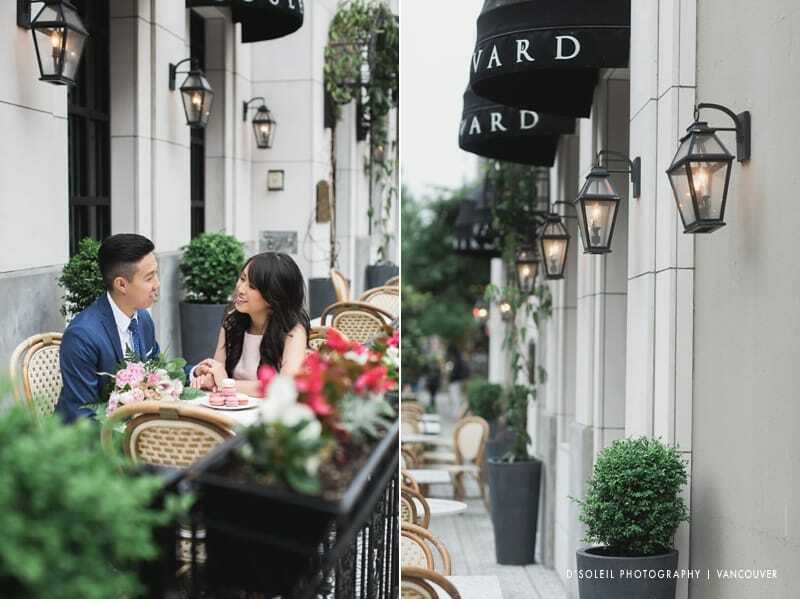 I spent some time with Priscilla + Jason at a very special outdoor patio engagement session at the Boulevard Kitchen & Oyster Bar at the Sutton Place Hotel in downtown Vancouver. 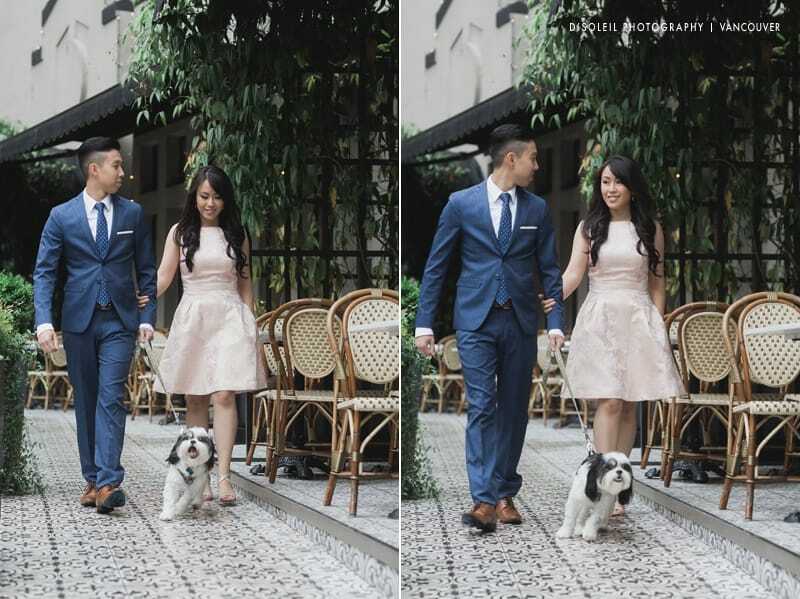 I still can’t believe these photos were all taken during a light rainy afternoon. 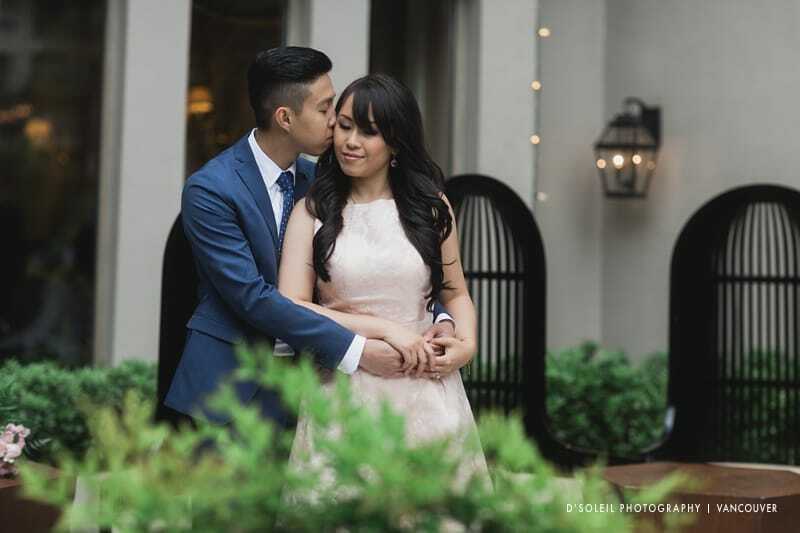 That ensured we had some soft lighting, but lucky for us, the rain didn’t spoil their patio engagement session. 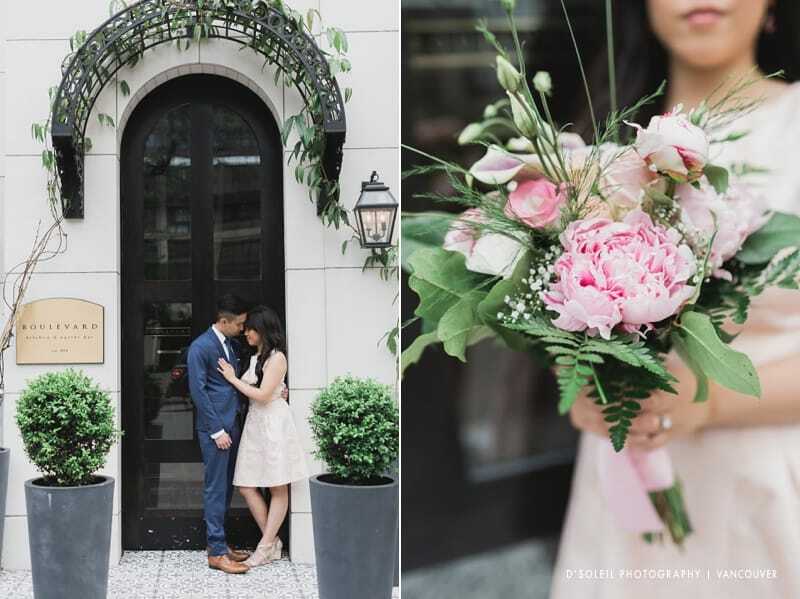 Priscilla and Jason wanted their session in a place that had a classic european cafe-like look and feel. A few venues popped to mind when they suggested this idea, but they already had a great one in mind. 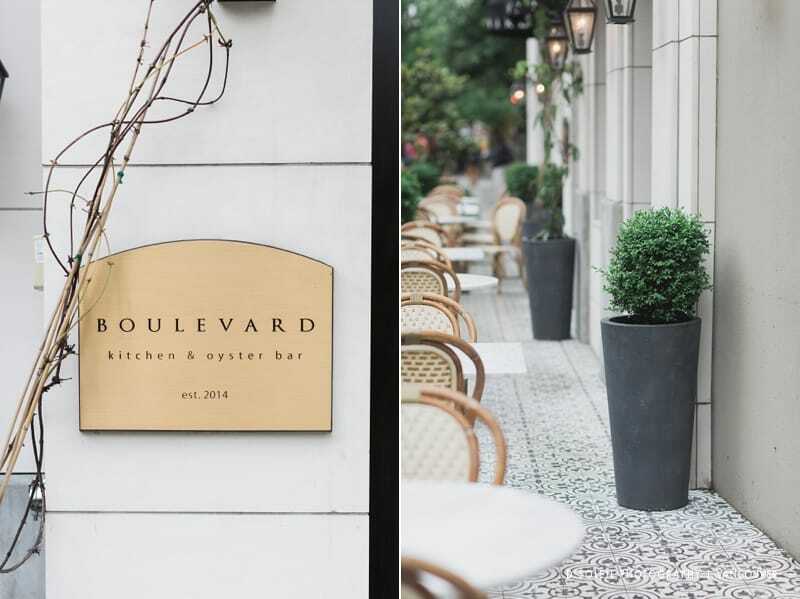 The Boulevard Kitchen and Oyster Bar is a fine dining restaurant located on Burrard St. near Robson, and adjacent the Sutton Place Hotel. 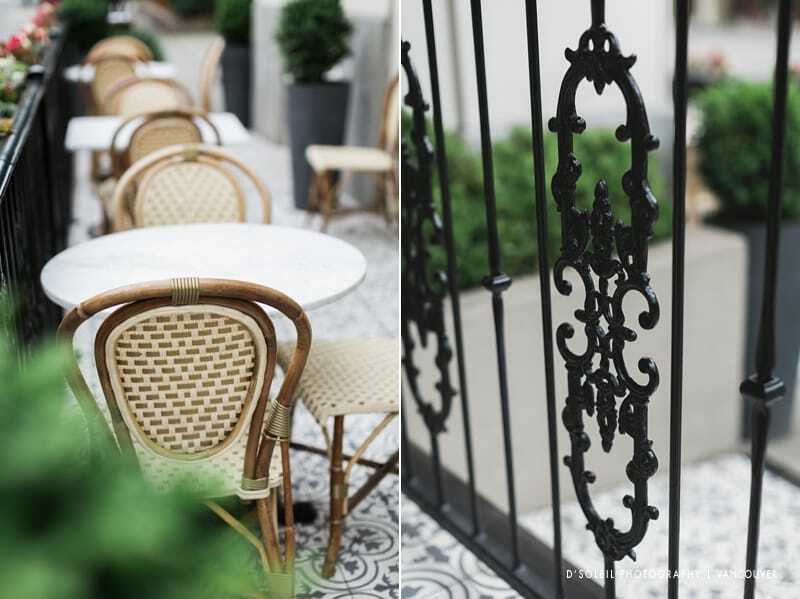 It’s a beautifully decorated bistro the would appeal to anyone with a taste for classic European architectural and contemporary bespoke style. 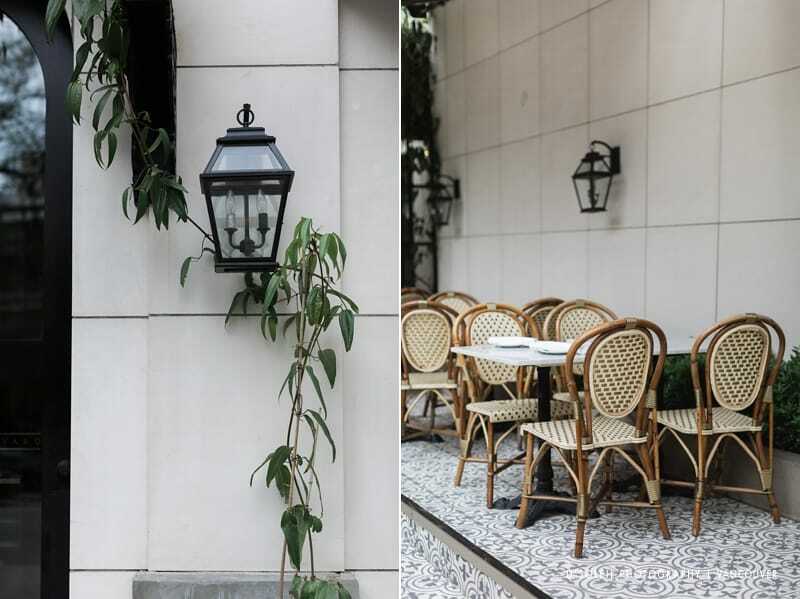 The outdoor street-side patio cafes of Paris and Milan immediately come to mind. 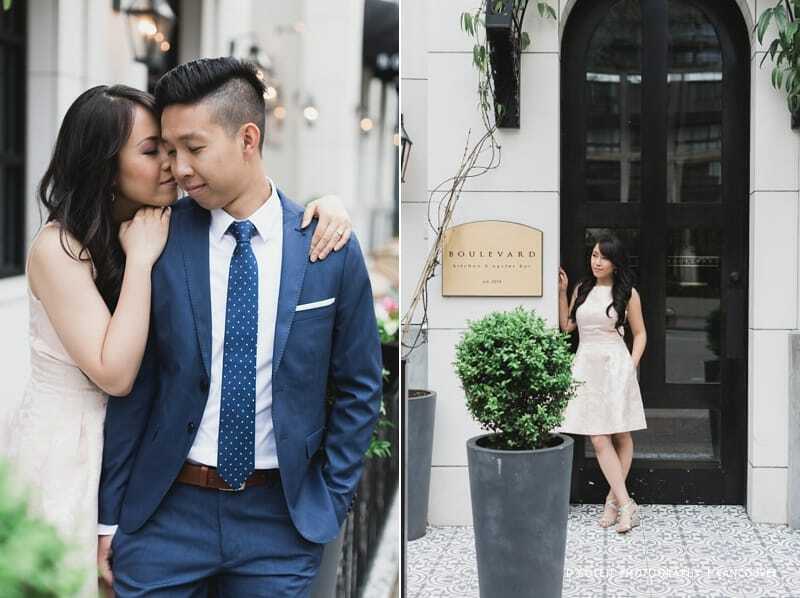 Despite it being a busy location, my aim was to produce a tranquil setting that focused on just the two of them. 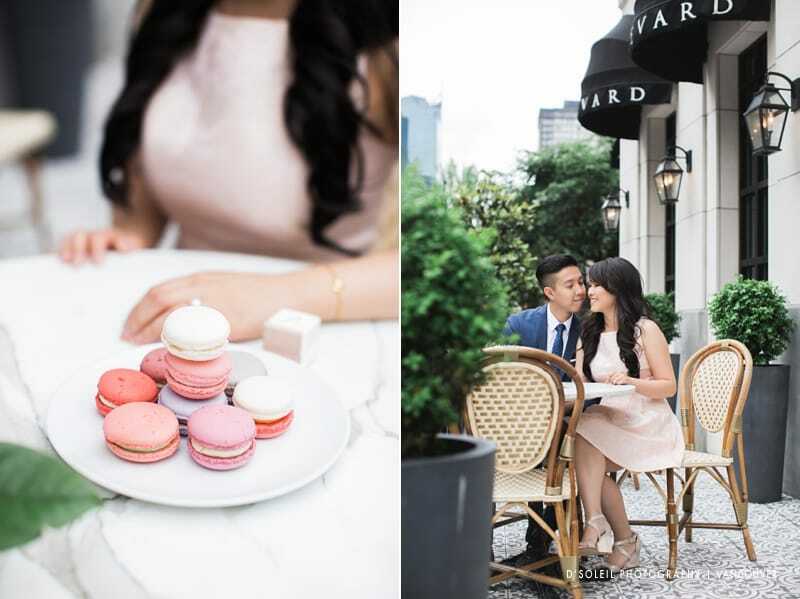 Despite the light rain, they looked comfortable together as they spent time over some locally made macaroons. Some of my favourite photos are of Piscilla in front of the narrow doors of the restaurant. 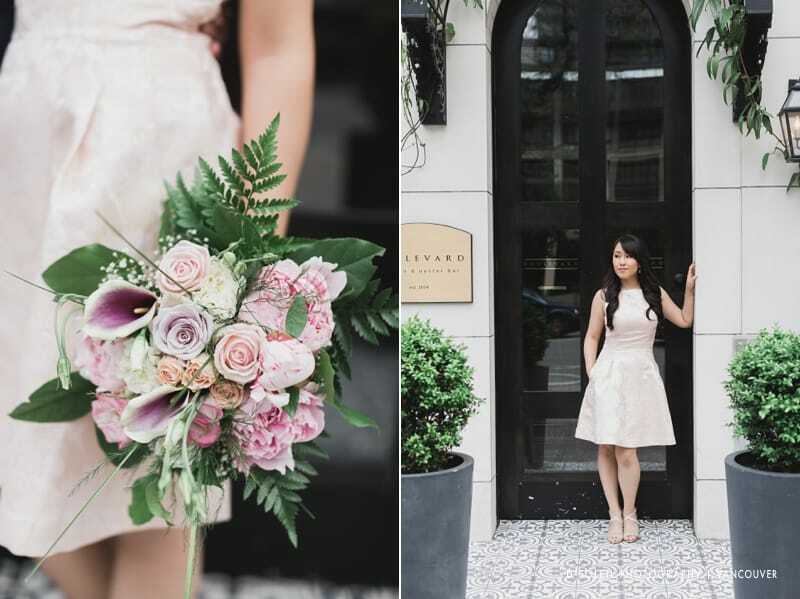 The subtle peachy pink colour of her dress worked so nicely with the facade of the restaurant and her matching bouquet added just a hint of spring colour to the pastel palette of stone beige, green, grey, and blue. 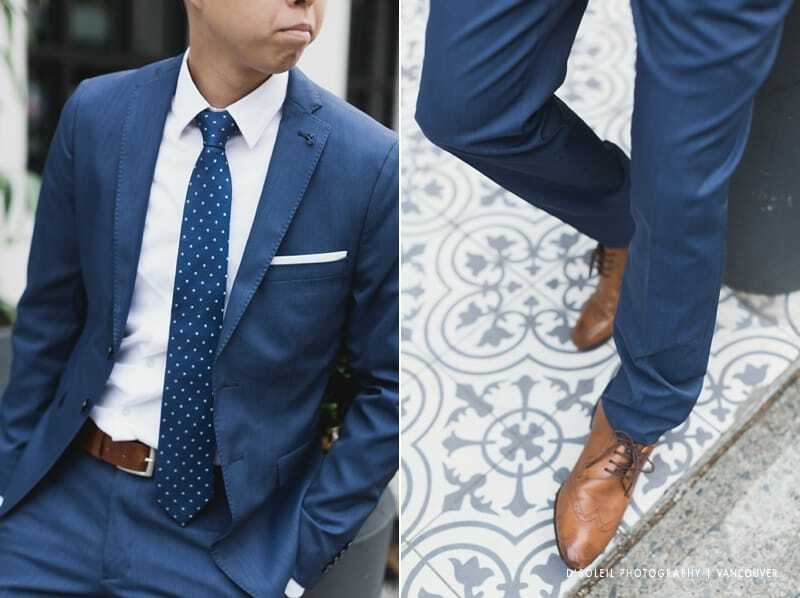 Jason looked prepped and dapper in his blue suit with a polkadot tie, crisp white shirt, and brown leather shoes. 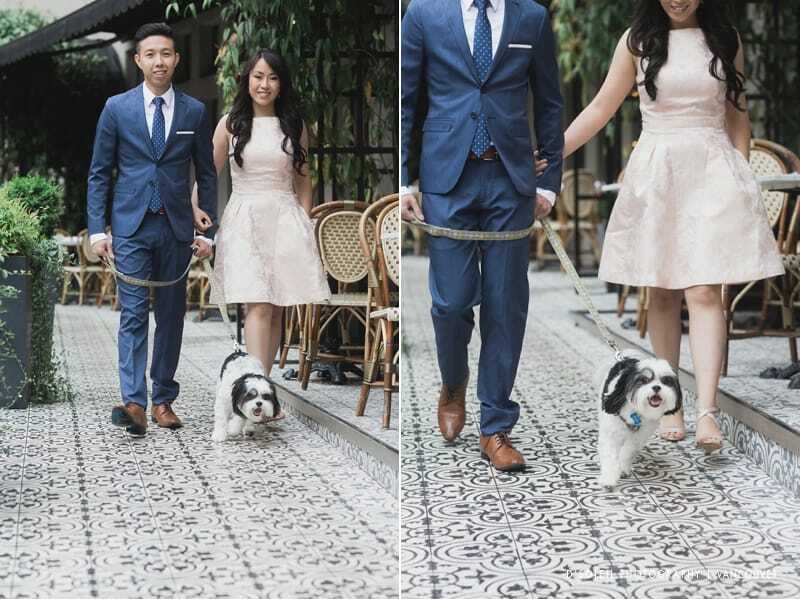 They also brought their dog along for the session, so we ended with a short walk along the outdoor patio of the Boulevard Kitchen & Oyster Bar. 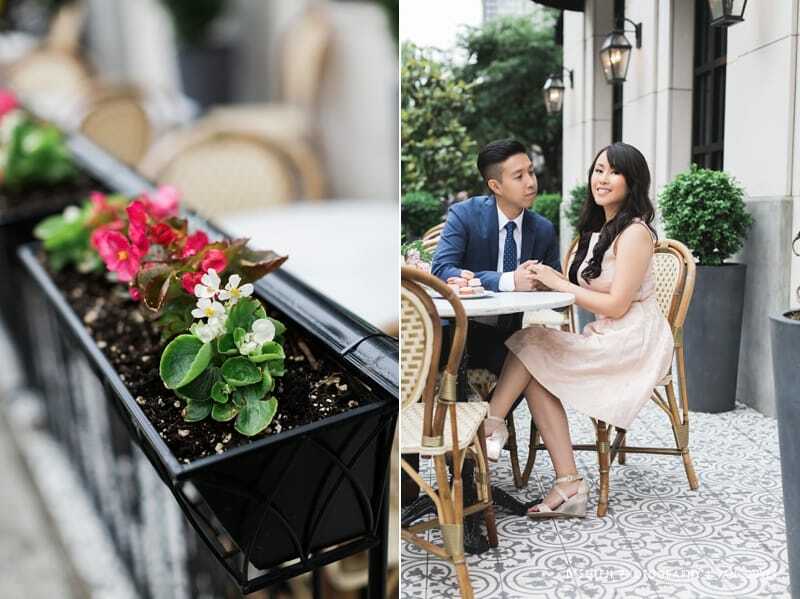 Thanks again for the great outdoor patio engagement session! 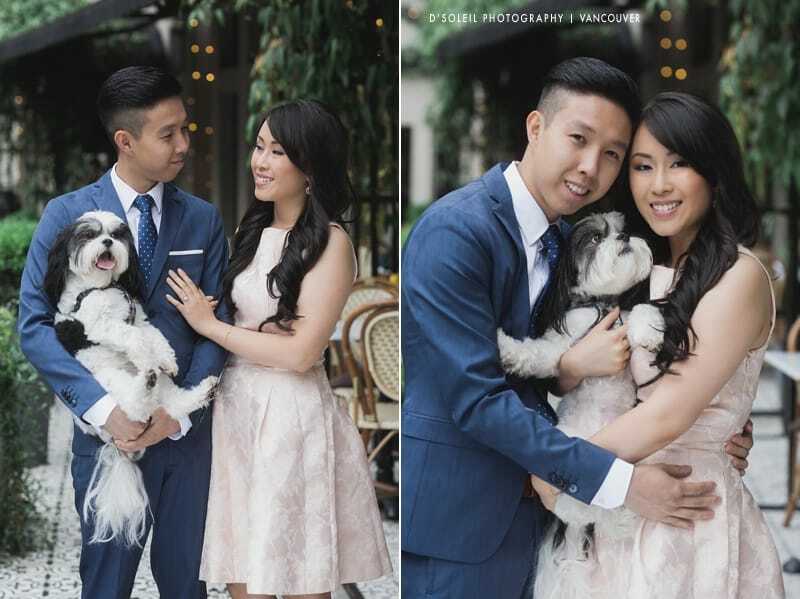 I look forward to seeing you both on your wedding day! Beautiful work! Worth sharing it.